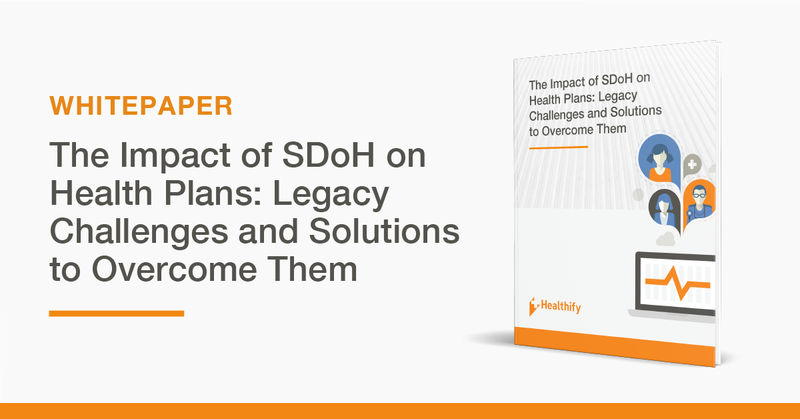 Healthify’s latest white paper, The Impact of SDoH on Health Plans: Legacy Challenges and Innovative Solutions, is now live and available to download! This new white paper examines the effect of unaddressed social needs on health plans, the challenges associated with implementing interventions, and how health plans can develop proactive strategies to overcome those challenges. Research shows that the social determinants of health (SDoH) can have significant negative effects on overall health outcomes and health plans have begun to take action. Despite best efforts, costs associated with care delivery continue to climb, while member health outcomes continue to remain stagnant or deteriorate. How can health plans get ahead of the curve and develop proactive strategies to address SDoH before members become high-cost? This white paper will explore strategic solutions to some of those challenges. Click the button below to access this free white paper.